The Newburgh-Beacon Bridge will be closed for at least a month to non-motorized traffic, starting today. Walkers, runners, and cyclists, already inconvenienced by the 93-million dollar road bed replacement that has been using their lane as a staging area, are now being turned back and told the bridge will be closed to non-auto traffic during the height of the cycling season. Access during construction is limited from dawn to dusk and only as far as the construction allows. Pedestrians and bicyclists will be required to turn around at the point of construction and return to the side on which they started. Got that? You can go almost all the way across, but not all the way. Sorry, but almost doesn’t count except in horseshoes and hand grenades. Certainly it doesn’t count when commuting to work. The cyclists that contacted us had no idea they could not make it the whole way—there was no signage, just a workman telling them to turn around when they got 2/3 of the way across. 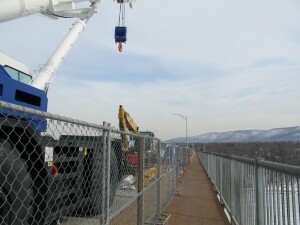 The Bridge Authority plans to have the walkway open on weekends during normal hours, but unexpected construction work may impact the planned weekend openings. The work is expected to be completed by the Fourth of July. In other words, don’t count on anything at any time. As a cyclist who once commuted to work by bicycle for over a year across the bridge to a job in Newburgh, I find this unacceptable. There has been no communication with the cycling community. With a closing this long, the bridge authority should consider giving a traffic lane to non-motorized transit during the repair period, particularly during the high season for these activities. Or at least free ferry service to those with bicycles. If you are planning a weekend trip, call the Newburgh-Beacon Bridge office at 845-831-3700 to find out the status of the bridge for that day. For the ferry schedule, call 800-533-3779. 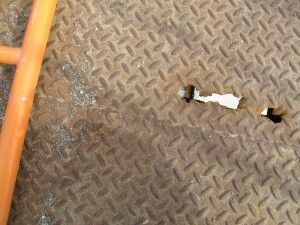 There are some small holes in the metal surface of the bike and walkway. Salt is probably the culprit. This spring I did notice small holes, particularly evident toward the Newburgh side, in the metal diamond plating that comprises the walk and bike lane surface, probably from salt washing down (the walkway does not get swept clean as far as I can tell; generally that is left to wind and rain.) I wondered what arrangements might be made when the plates would eventually need replacing. I did not expect it to happen so soon or without any notification to users. 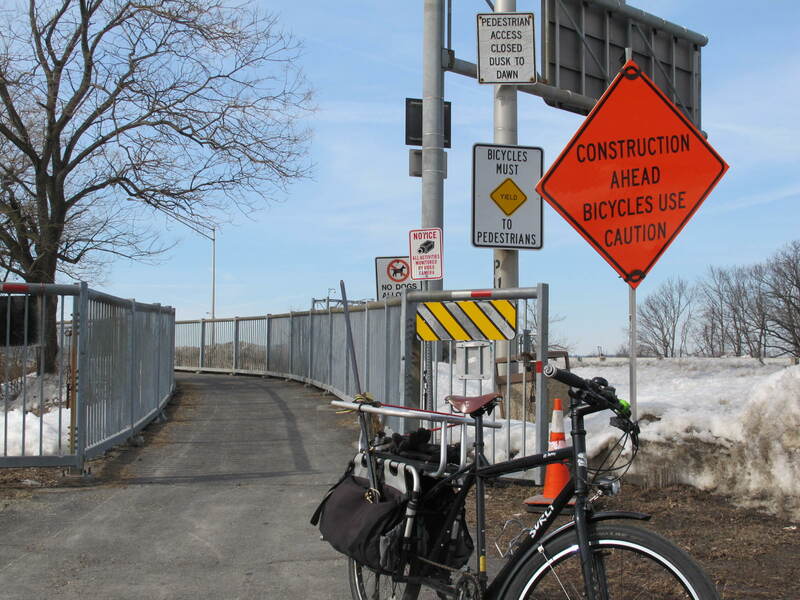 Barring an unforeseen structural deficiency that imperils the public and requires immediate closure, the Bridge Authority should have reached out to walkers, runners, recreational and commuter cyclists well in advance of shutting the walkway. Cyclists and runners have been dealing with a constricted lane due to roadbed repair of the traffic lanes. is it open all the way across now? where can I park my car to start the ride? The bridge closing during the weekdays has been extended another month, through August. It is generally open on weekends, but call the number listed in the post to be sure it will be open the day you plan to cross. There are two parking lots just north of the overpass on either side of Grand Avenue on the west (Newburgh) side of the bridge. There have been rust-out holes in the walkway for many years. It’s always been a little disconcerting to walk/run and pass those holes, wondering how thick the metal is under your feet.